Silo Studio describe their practice as ‘handmade hi-tech.’ They playfully combine manual skills with industrial processes to reveal possibilities that the production line doesn’t see, often using tools and materials in ways that most would consider mistaken. Commissioned to explore the opportunities in Hull-based industry, Silo Studio approached galvanising plant Humber Galvanizing, and Daifuku Logan, specialists in baggage system manufacture, to find new ways of making things. Experiments with galvanized steel mesh and sheet metal resulted in the installation on the façade of Humber Street Gallery. 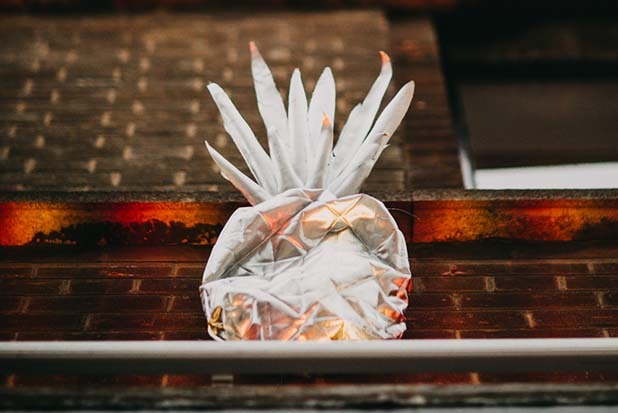 The pineapple motif references Kingston upon Hull’s history as a port city and the import of exotic goods, as well as Humber Street’s recent history as a wholesale fruit and vegetable market. Supported by Humber Galvanizing Ltd and Daifuku Logan Ltd.